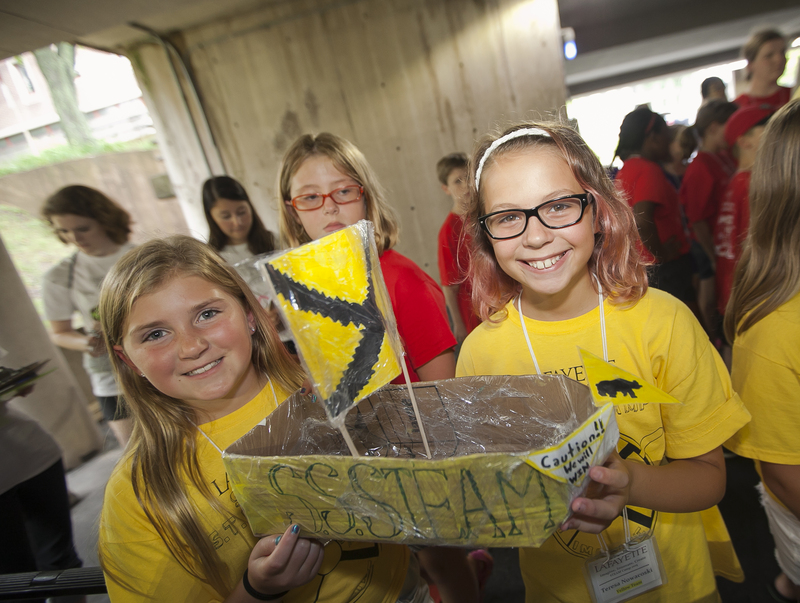 Camp leaders Marlin, film & media studies and English, and Meng, civil engineering, personify the synergy of incorporating arts into science/engineering education—a concept that has gained pedagogical steam in the last decade. 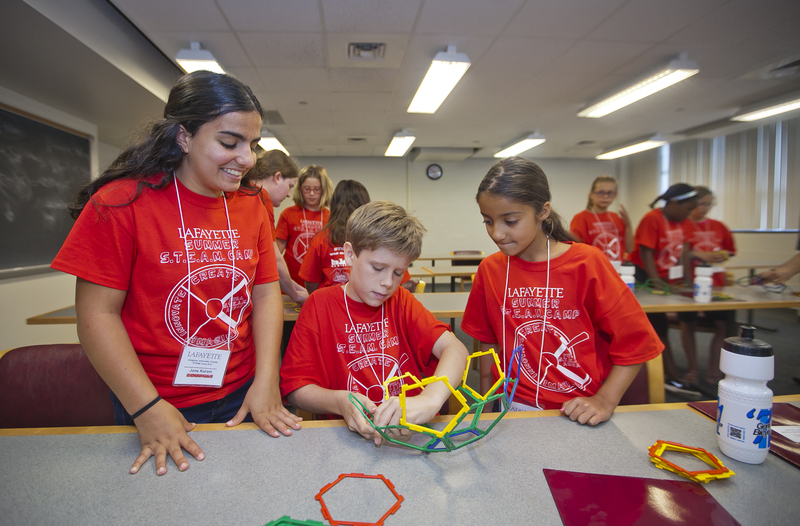 “I want engineers and arts to combine, to get kids excited,” says Meng, who is thrilled that girls outnumber boys among the 60 campers. Meng says she chose Lafayette so she could develop communication skills and creativity in addition to engineering. Extracting watercolors from everyday ingredients, such as turmeric, beets, and mums, campers learned about the art history of pigments and the botany of color-producing plant cells. Rachel Rubino ’17 demonstrated the buoyancy of everyday objects like an orange in the Sink or Swim module. Different amounts of water in bottles affects the sound the bottles make when tapped. 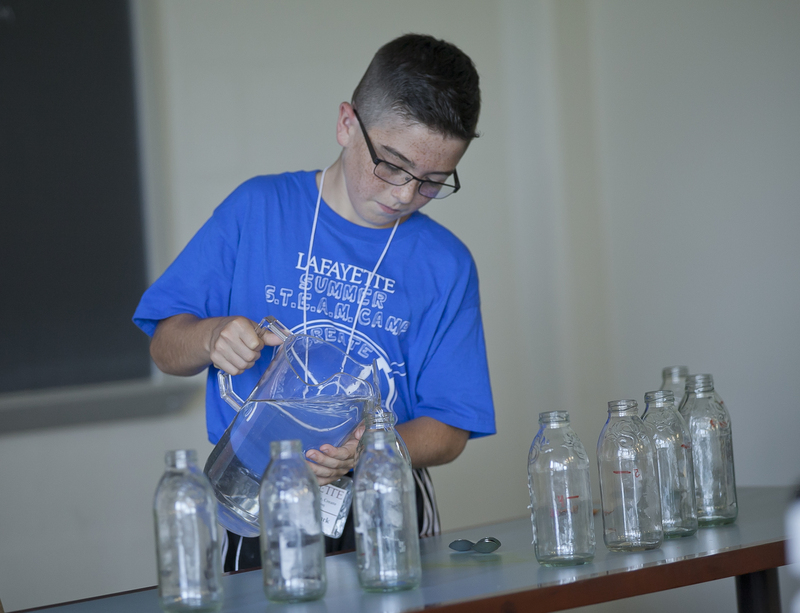 Campers worked together to create their own musical piece using these different tones. Taught by mathematics professor Ethan Berkove, campers manipulated polyhedra to emphasize the unique geometric functions of each shape. 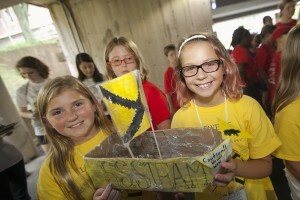 For the final challenge, teams competed with boats of their own design. 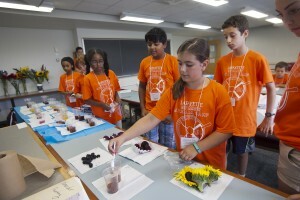 Biology professor Elaine Reynolds led campers in looking at the nutritional content of foods by breaking them down into pure fat, sugar, and carbohydrates. 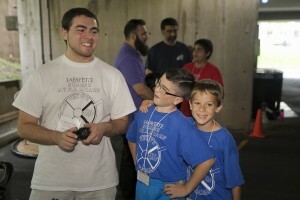 Student co-leader Matt Marlin ’16 with STEAM campers. 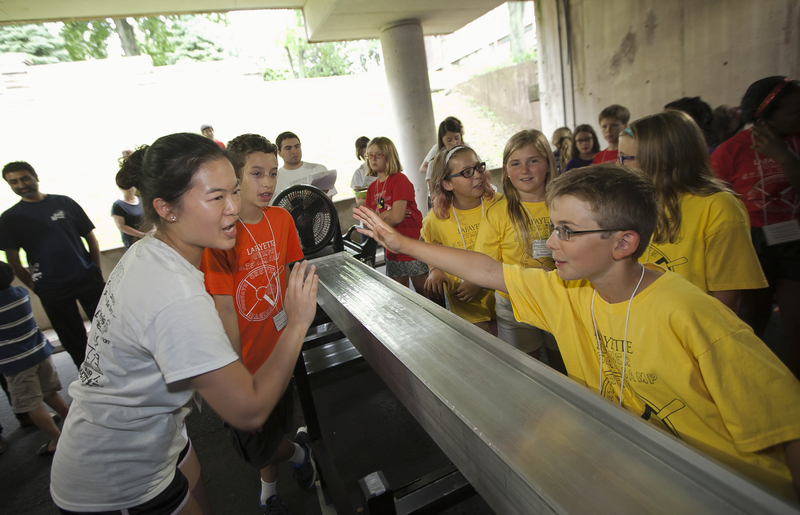 Student co-leader Monica Meng ’18 encouraged members of the yellow team during the STEAM Camp final challenge. Improving education in science, technology, engineering and math is also a passion of President Obama, who launched the Educate to Innovate campaign — a coalition of government agencies, corporations, universities, and philanthropies — to enable more under-represented students to excel in STEM subjects. According to Obama, encouraging education and innovation in those fields is vital to a robust economy. 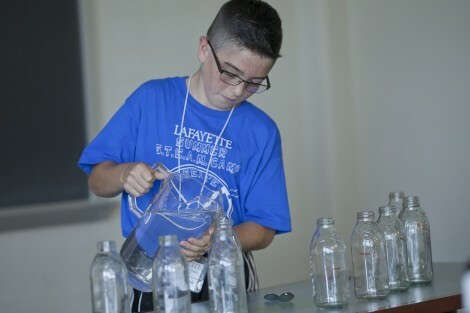 Funded in part by the Mellon Foundation, Center for Community Engagement, and private donations, the 2015 Lafayette STEAM camp –held on campus July 27 to July 30–involved kids in four days of hands-on learning modules and fun activities culminating in a Final Showcase groups project. The theme Imagine, Innovate, Create revolves around design. Biology professor Elaine Reynolds led campers in looking at the nutritional content of foods by putting pure fat, sugar, and carbohydrates into containers. 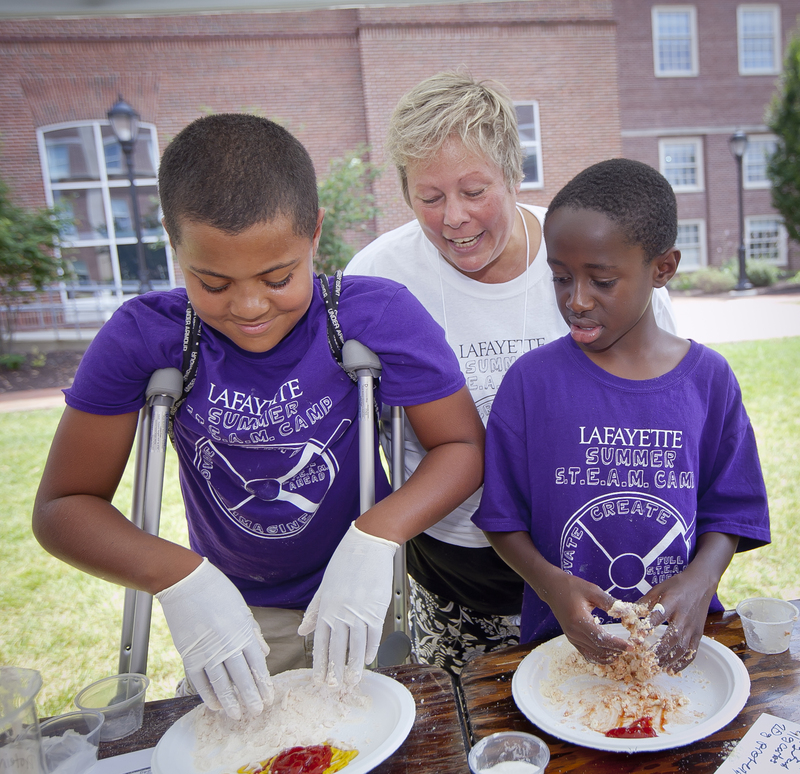 Campers learned the exact macro contents by measuring out these raw components and then topping/decorating them as if they were actually preparing to eat the food they make up. 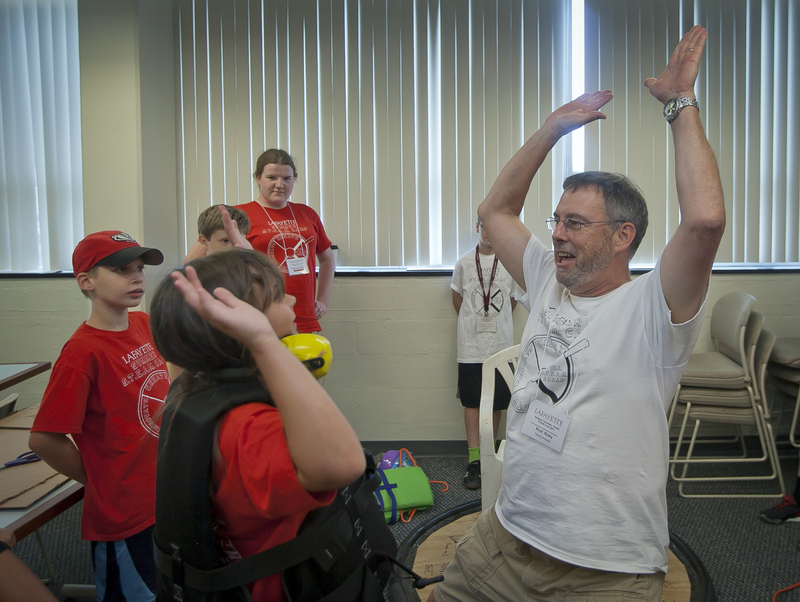 Building a miniature hovercraft using CDs, balloons, and other household items, campers learned the conditions a larger hovercraft need in order to work properly. They then researched how to provide hovercrafts with a sustainable energy source. Marlin and Meng, who both have previous experience working with elementary students, conceptualized and developed 12 learning modules. 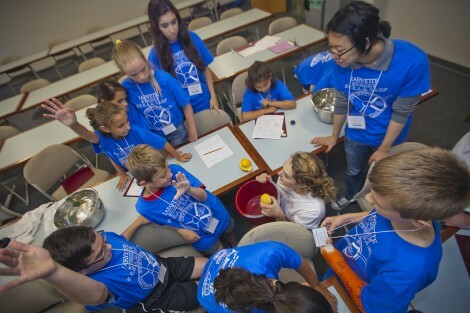 Two local educators advised them on grade-appropriate activities, and Rachel Rubino ’17, who has taken education courses with John Squarcia, worked with them on teaching methods. 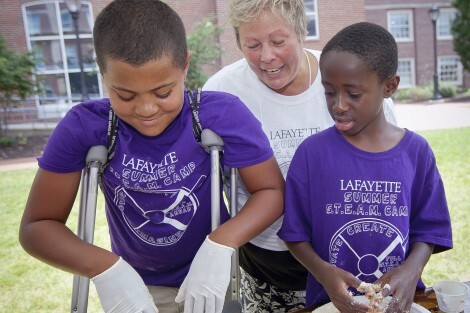 Marlin and Meng then organized the camp schedule, publicized the event, signed up the campers, and recruited/trained more than 30 volunteer Lafayette students as counselors and facilitators. 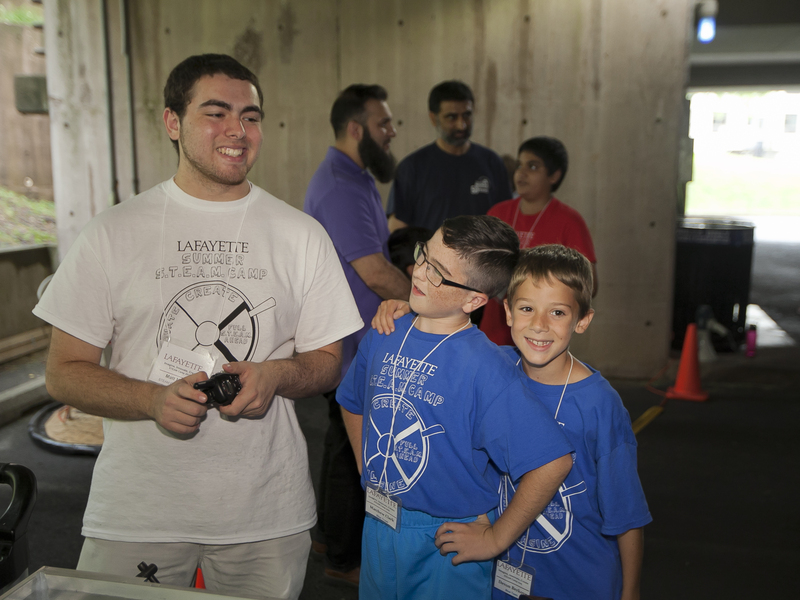 As a test for a more formalized way to reach under-served students who have no transportation to get to campus, Marlin and Meng conducted three of the STEAM modules at the Easton Area Community Center the week prior to camp. 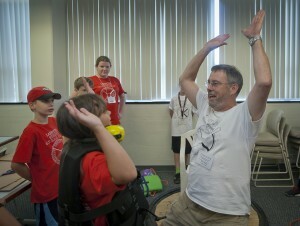 Camp student leader advisor Art Kney is associate professor/department head of civil & environmental engineering. Camp student leader advisor Art Kney, associate professor/department head of civil & environmental engineering, started the camp four years ago with Rebecca Citrin ’14, a civil engineering graduate. “I push the students beyond what they think they can do,” says Kney. 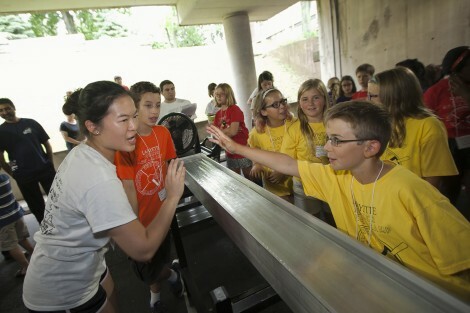 It was Kney’s brainstorm to bring on three seventh-grade camp alumni as counselors in training.